Lee, as Washington's senior subordinate, was initially appointed commander of the advance force, but turned it down because of his doubts about the plan. However, when the force was increased to 5,000 men and the command offered to the Marquis de Lafayette, Lee changed his mind and insisted on the command. Lee met with his subordinates but failed to give them proper orders, resulting in a piecemeal and disorganized attack on June 28 against the British rear guard under Lieutenant General Charles Cornwallis. After several hours of fighting in the hot weather, the British counterattacked and Lee ordered a retreat, which rapidly became a rout. Washington, advancing with the main force along the Monmouth road, encountered Lee and his fleeing troops, with the British in pursuit. After a heated discussion with Lee, Washington relieved him of command and sent him to the rear. He then rallied Lee's troops, who delayed the British pursuit until the main force could take up positions further to the west. The remnants of Lee's forces then withdrew to the main American force, where the newly-trained Continental Army troops held the British, repelling several attacks. The British fell back, rested, and resumed their march to the northeast during the night. The exhausted Americans could not pursue. The next morning the Americans found the British had slipped away during the night, continuing their march without incident to Sandy Hook, arriving there on June 30. The British force was then transported by the Royal Navy across Lower New York Bay to the safety of Manhattan. The battle was a tactical British victory, as the rearguard successfully covered the British withdrawal. However, strategically it was an American victory, as they were left in possession of the field, and had demonstrated that the Continental Army regiments could stand against the British regulars. 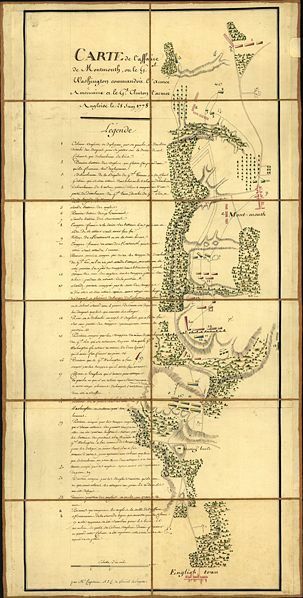 On June 28, in the morning, the British were camped along Dutch Lane and the Freehold-Mount Holly Road, while the main Continental Army was camped at Manalapan Bridge, 4 miles west of Englishtown. At 8:00 A.M., Lee's advance body of 5,000 troops and 12 guns approached the British rear guard a few miles north of Monmouth Court House. They slowly moved forward. Dickinson reported that he was engaged with the British and they seemed to be falling back. Wayne's division skirmished with a British converging party, but almost immediately Lee lost command of this situation. He issued various orders moving units from one place to another, never developed a clear plan of attack, and his subordinates became confused. Lee had failed to gather data on the ground or the position of the British, and now he heard conflicting reports that the British was moving out and that they were preparing an attack. Lee was annoyed at the lack of intelligence about the British, which he had failed to order gathered. The British were both falling back, moving their baggage, and preparing an attack with the rear-guard, but Lee couldn't get reports that clearly stated this. Lee finally got a picture of the British placements in his head and ordered units to move to their left and right, to cut off the 1,500-man British rear guard and capture them. Units marched out to the flanks, but then received no orders. Wayne, in the center, was told to feint an attack. Lee wanted hold the rear guard while he encircled the British, but his officers didn't know the plan. Wayne's brigade was the first to make contact with the British, just north of Monmouth. The spreading fight alerted Clinton to the proximity of a significant American column in his rear. Brig. Gen. Count D. von Knyphausen was ordered to watch his left flank and continue marching. Meanwhile, Clinton turned Lt. Gen. Charles Cornwallis's wing of 14 battalions and the 16th Light Dragoons around to meet and crush Lee's vanguard before the rest of the American army could reach the field. The British movement disrupted Lee's plan to isolate and destroy their rear guard, and threatened the American right flank. Lee sent Lafayette towards the right to support it. As they did, the British opened up on the Americans with their cannon. Lee sent some of his men into Monmouth to avoid the fire. On the left, the flank units saw what seemed to be a retreat in the center as Lee's men took cover. At the same time, Oswald's artillery unit in the area moved to the rear when they ran out of ammunition. The flank units on the left moved back, since they had no orders. They failed to inform Lee of their movements or sent word for orders, although they did ask some of Lee's aides if they had orders for them. Lee rapidly lost control of the situation and his command began retiring to the southwest and the west along the causeway crossing Middle Ravine. Clinton's infantry rapidly pursued the fleeing Americans. Some attempts were made to establish hasty defensive positions during the withdrawal, but much of Lee's command moved as a disorganized mob. Lee made no orders, had no rear guard, and no one understood why they retreated. Lafayette sent for Washington to come forward. Lee thought he was saving the advance corp by moving it out of harms way. Washington sent a request to Lee for a report of the battle and Lee sent back word that he was "doing well enough." Not satisfied with this response, Washington moved forward to find the roads crowded with retreating American troops. He dispatched aides to find the cause of the retreat. The troops reported they were ordered to retreat by Lee. Riding down the road, he found Lee leading a retreat across the Rhea Farm. Washington asked him for the meaning of this, and Lee thought he had saved the army by retreating. Washington repeated the question and Lee stammered some excuses about his orders not being followed, then said that the American army should not bring on a general engagement against the British. Washington rode back to the rear of the retreating troops, where his aides reported the British were within a few minutes of reaching the retreating column. Seeing the corp endangered, Washington rallied the disorganized elements of Lee's command into a new line behind a hedgerow, into blocking positions. This would hopefully slow down the British until the rest of his army could come up. Washington gave Lee orders to begin a delaying action while their main force regrouped. These units put up a stiff resistance, and then under pressure, they made a fighting withdrawal to safety. Washington began to order the troops into a strong defensive line. Artillery was rushed forward and Greene unlimbered at least 4 cannons on a prominent bit of high ground below the stream known as Comb's Hill. Supported by a brigade of infantry, Greene's artillery enfiladed the advancing British. This fire, combined with small arms and supported by other artillery fire from the front temporarily stabilized the holding position. Clinton brought up his artillery and an artillery dual began. This was one of the most intense artillery duels of the war. A mounted attack against Washington's left, together with a final British push by mounted infantry and grenadiers, folded and broke the holding line. At 12:30 P.M., the battle resumed as the British pushed across the Dividing Brook. After brief, vicious clashes in a wood lot and along the hedgerow, the Americans, under Lee, fell back across Spotswood Middle Brook. As the British charged the bridge, they found the Americans occupying a very strong position on the Perrine Farm ridge behind a battery of 10 guns. Exhausted from a forced march and cannonaded with grapeshot, the British faltered and the attack collapsed. To silence the American artillery commanding the bridge, the British positioned 10 cannon and howitzers in front of the hedgerow. For hours, the largest land artillery battle of the war raged. The Americans won the artillery duel late in the afternoon. As the fighting raged on in the north, Cornwallis organized an attack in the south against Greene's front. In precise rows, they advanced towards the Americans. Greene's men shot the British from the front, and his artillery ripped into their flanks. The guns raked the hedgerow, forcing the British artillery to withdraw and their infantry to shift position. Unable to break through and having suffered heavy losses, Cornwallis gave up. A series of heavy attacks were launched against Wayne's men in the center of the American line before Cornwallis had finished, but those were also repulsed. As the British artillery fell silent, Washington cautiously counterattacked. First, two New England battalions advanced along Spotswood North Brook to skirmish with the retreating Royal Highlanders Then, Wayne led 3 Pennsylvania regiments across the bridge to attack the withdrawing British Grenadiers. After some heavy fighting, Wayne's men were forced back into the shelter of the parsonage buildings and orchard. At 3:30 P.M., after a bitter stand-up fight in the afternoon heat and humidity, Clinton orders his troops to withdraw. 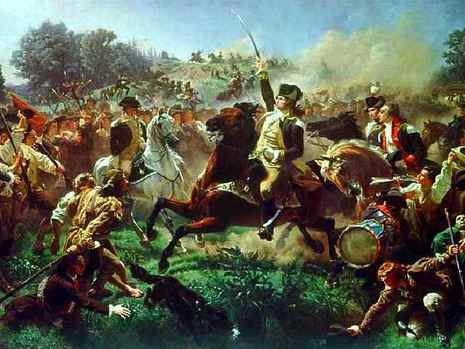 Washington wanted to pursue the fleeing British but in the heat and humidity, his troops were too exhausted. At 5:30 P.M., with Wayne's men now on line with Alexander and Greene, Washington straightened his front and waited for Clinton's next move. That move never came. As dusk fell, he had fresh troops ready to attack around the British flanks, but they had to hold due to the loss of daylight. Clinton withdrew his troops about 1 mile to the east. During the battle, Mary Ludwig Hayes (known today as Molly Pitcher), a camp follower who brought water to the troops from a nearby spring, took over her wounded husbands place at a cannon when he was wounded. Under fire, and losing men, the artillery unit was going to fall back until she volunteered to take his place. Bravely, she served the cannon in her husbands place. At 10:00 P.M., after being allowed to bivouac for a few hours, Clinton silently awakened his troops and ordered them to begin to follow the baggage train. They broke camp and marched on toward Sandy Hook in extreme northeast New Jersey. From there, they quickly embarked upon a short voyage over Lower New York Bay and through The Narrows to the safety of Manhattan. Washington prudently decided not to follow and instead marched his army northward to rejoin other American forces encamped along the Hudson River. Though Washington had failed to destroy the British column, he had inflicted damage to their troops, and proved that American troops, if properly led, could stand against the British regulars. The British had defended their baggage train, but were unable to defeat the Americans in open battle.